As Government Shutdown Drags On, So Do Economic Worries The partial government shutdown is hurting the pocketbooks of 800,000 federal workers. But it also could affect consumer and business confidence down the line. Ten days into the partial government shutdown, it's time to ask a dreaded question: What if this keeps going? A new congressional session begins Thursday, at which time Democrats become the majority in the House. There's no indication that progress will be made before then on the political standoff over funding a border wall that President Trump is demanding. Nine federal departments and agencies are affected by the shutdown, including Agriculture, Commerce, Justice, Homeland Security, Housing and Urban Development, Interior, State, Transportation and the Treasury. But the entire government isn't closed, and many of its parts are still functioning. The Department of Veterans Affairs tweeted a reminder that payments to veterans are unaffected by the shutdown. Social Security checks will keep being sent. And at least for the month of January, Supplemental Nutrition Assistance Program (SNAP) benefits will still be distributed to eligible households. The U.S. Postal Service, an independent agency, is unaffected and notes that its operations are funded not by taxes, but by the sale of postage and other products and services. The Department of Agriculture released a list of activities that will and won't continue during a shutdown that continues into the new year. Some things that will not be affected: meat, poultry and egg inspection, as well as Forest Service law enforcement and emergency and natural disaster response. School lunch programs will continue into February. Other domestic nutrition assistance programs, such as WIC (Women, Infants, and Children), can continue to operate with any state and local funding that's available, but won't receive federal funds during the shutdown. However, recreational sites operated by the U.S. Forest Service will be closed, unless an external group has stepped in to fill the void left by the absence of federal employees. USDA Farm Service Agency offices have already closed. There won't be provisioning of new rural development loans and grants, and there won't be new timber sales. Wildfire response is being affected, too. Kait Hess is an emergency response planner at the Environmental Protection Agency in Philadelphia. Her office has been deploying personnel to support wildfire cleanup response in California. "The personnel being deployed are exempt from the shutdown, but the fact that we can't man our [Emergency Operations Center] to support our people who are going — in the event they have any questions or concerns — is unsettling," Hess tells NPR. If the shutdown drags on, it may be difficult for her office to make its next round of deployments to help with wildfire cleanup. About 800,000 workers are affected by the shutdown. Julie Burr, who works as an administrative assistant in the Department of Transportation and is a single mom, told NPR's All Things Considered that she has picked up a second job to get through the shutdown. "That's only about 25 percent of my pay that I make at my federal job, so it's not going to pay all of my bills, obviously," she said. And because she's a contractor, she's unlikely to get any back pay once the shutdown ends. "I guess the drastic thing would be to start taking back Christmas gifts or, you know, maybe selling things," Burr said. "I don't know. I hope it doesn't come to that." Chris Kendrick is an IT specialist at the USDA in Columbia, Mo. He told NPR that he and his wife are anxious about a long shutdown. "Since I will get my next check, we should be OK," he wrote. "But the issue will be the next two weeks and on as I then won't have a check coming. We do have savings, but with the holidays, and I had a short stay in the hospital, I expect some large bills soon. "Further, while often federal employees receive back pay, I've no confidence this will be the case when we do return to work," Kendrick says. "Finally, while focus has been with federal employees, what is not mentioned is the impact to contractors and vendors. Contractors often are forced to take vacation, and if not, are simply unpaid with no back pay at all." In Ventura, Calif., Kristie Scarazzo works as a botanist for the U.S. Fish and Wildlife Service — her dream job, for which she recently drained her savings account to move to the area. She told NPR's Weekend Edition she's very worried about a longer shutdown. To prepare, she filled out a state unemployment application. "I've never had public assistance before. So I have, you know, mixed feelings about that." Scarazzo wants lawmakers to know that the shutdown affects the lives of ordinary people. "I think, at the end of the day, you know, we just have to remember that there are individuals that are trying to make it work and support their families," she says. "You know, there's a lot of people that take great pride in being a public servant and being able to do the jobs that we do. And it's just an unfortunate situation." Economists say the impact on the larger economy won't be large, as long as the shutdown ends soon. That's partly because the shutdown has spanned a holiday period when government work is generally quiet. 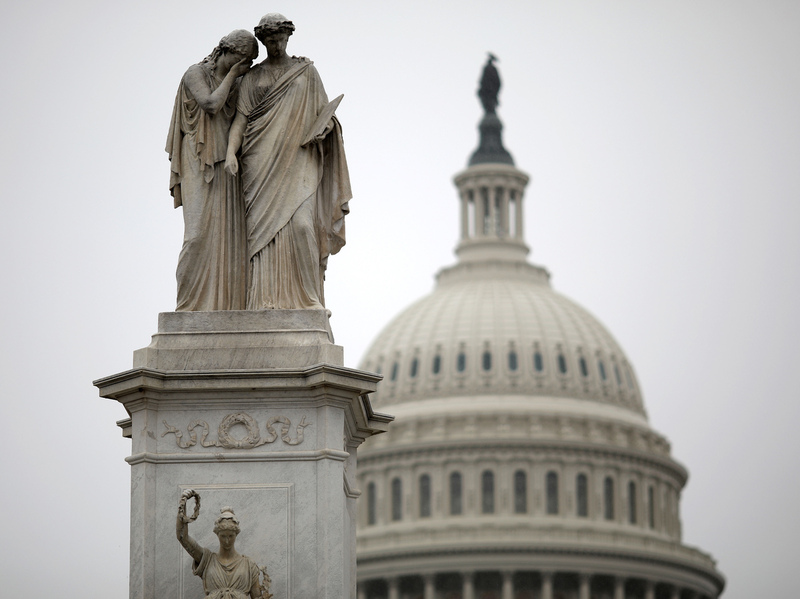 A longer shutdown could affect consumer spending, as federal employees continue to be furloughed or work without pay. Sharon Stiteler is a park ranger for the Mississippi National River and Recreation Area, and she's been through four government shutdowns. "Sometimes at 2 a.m., I might have a bit of a panic attack that, you know, I'm not a useful contributor to my household," she told All Things Considered. "And, my goodness, maybe I should not have bought the more expensive lettuce today. Who knows how much longer the shutdown's going to last?" And then there's the issue of confidence, from both consumers and the market. "What would be worrisome is if businesses start to lose confidence" in the government, Kathy Bostjancic, head U.S. financial market economist at Oxford Economics, told The Wall Street Journal. "They'll pull back on hiring and investment, and it'll become a self-fulfilling prophecy, where negativity in the stock market turns to negativity in the [broader] economy." The shutdown is also affecting the release of economic data. The monthly jobs report will still come out, but the Bureau of Economic Analysis and the Census Bureau have both ceased reporting, CNN Business reports. Ditto with reports on crop production and pricing from the Department of Agriculture. Experts say that the economy has rebounded after previous shutdowns. But many forecasts already predict economic growth in 2019 to be slow – and a long shutdown could compound that.